Congratulations to our winner, Mami2jcn, selected randomly via random.org (1-99>76). Tis the season for Halloween galas, longer days (*yes, I know they're actually "shorter", but I am writing from the parent's perspective), and whiny children. Ok, maybe that last part is just me (...it's been a long weekend). 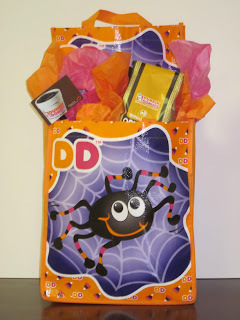 I am so excited to be able to giveaway this fun and snazzy Halloween Trick-or-Treat bag, care of Dunkin' Donuts. Think of the possibilities. Hoard it for yourself and get a yummy latte every day on your way to work. Celebrate the season with your family and treat them to some spookily decorated desserts. I happened to be in a store this past week and saw the posters for the Halloween themed donuts and munchkins. Seriously, they are every mom's kid's dream come true. This giveaway will close on October 23, 2010. I received nothing for hosting this giveaway except a craving for a mocha latte and visions of orange frosted donuts dancing in my head. I love Dunkin Donuts...especially the iced caramel latte!! I love blueberry cake donuts at Dunkin Donuts. I'm a new follower of this site. My kids love the strawberry frosted donuts. My husband is a big fan of Dunkin Donuts coffee. I also love the bagels at Dunkin Donuts. Lately my husband has been having the flatbread sandwiches at Dunkin Donuts for lunch. My husband usually takes our older 2 children to Dunkin Donuts for breakfast on Saturdays. It's a special treat. I'd love to win that so I can spend $31 on munchkins!! Yum! Thanks so much for the chance!! I love Dunkin Donuts. Yo, I'm a follower, your brother in law, and I crave an iced mocha latte! I don't care who knows it. I love the munchkins at Dunkin Donuts. The blueberry muffins are great, too! Dunkin Donuts is a family favorite of ours. We had one around the corner from where we lived when I was a kid in NJ. The flatbread sandwiches are a big hit with my husband. I would love to buy munchkins for my son's kindergarten class. My husband loves the boston creme donuts. Everytime I go to Dunkin Donuts, I wonder how the employees there stop themselves from eating donuts all day. The smell is very enticing. A 50 count box of munchkins sounds awesome! I love the Halloween and fall themed donuts this time of year. The smells at Dunkin Donuts feel so comforting to me. My kids absolutely love Dunkin Donuts. I'm not much of a baker so the treats at Dunkin Donuts are really special to our family. This is an awesome giveaway and I'd love to win! Going to Dunkin Donuts is a special treat for the kids. Our local Dunkin Donuts also has a Baskin Robbins attached to it. Donuts and ice cream are a great combo! My husband would be very excited if I won this! The muffins at Dunkin Donuts are also fantastic. I love the blueberry muffins. I'm craving a Dunkin Donuts bagel with cream cheese right now. Taking the kids to Dunkin Donuts would be a nice reward for a good report card. We have a local bakery and their donuts do not compare to Dunkin Donuts. Dunkin is the best! Some interesting facts about Dunkin Donuts: It was founded in 1950 in Quincy, Massachusetts. Dunkin' Donuts is the world's largest coffee and baked goods chain, serving 2.7 million customers per day at approximately 8,800 stores in 31 countries which includes approximately 6,400 Dunkin' Donuts locations throughout the USA. Surprisingly there are no Dunkin Donuts locations in California...good thing I'm on the East Coast. Dunkin Donuts' top competitors are Starbucks and Krispy Kreme. Dunkin is definitely my favorite! Dunkin' Donuts has more than 1,000 donut varieties! Dunkin Donuts has great smoothies, too. I appreciate how Dunkin Donuts has a DDSMART healthy menu. The new items are reduced in calories, fat, saturated fat, sugar or sodium by at least 25%. I like the Dunkin Donuts slogan "America Runs On Dunkin". Dunkin's "Time to make the donuts" won honors from the Television Bureau of Advertising as one of the five best commercials of the 1980s. Easy Bake Oven, which is a product of Hasbro, created product recipes based on Dunkin' Donuts products. Dunkin Donuts coffee smells great. We could get a lot of donuts with $31! Munchkins are great for parties. just had a pumpkin coffee last night....yum!! Oh Wow this is awesome. Thank you. My husband loves Dunkin Donuts so much he even looked into how much it would cost to buy a DD franchise. My husband and sons are at Dunkin Donuts right now! I hope they bring me back something! I could go for a donut or a muffin.